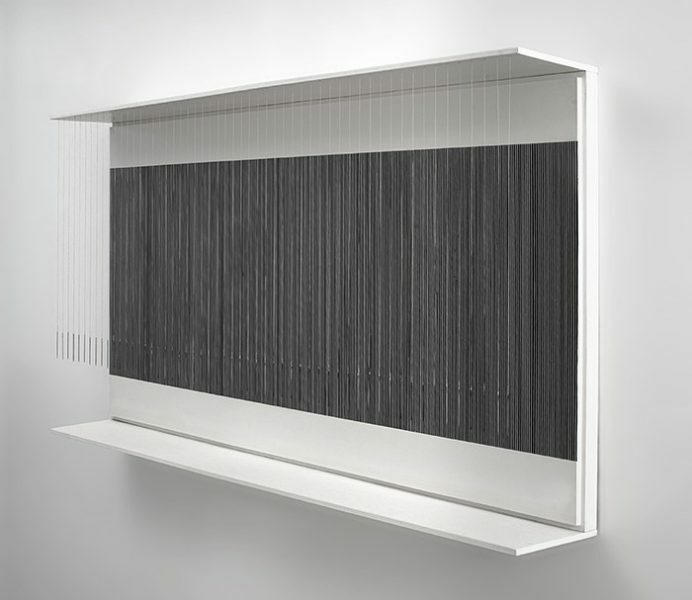 Gallery view, Vapor and Vibration: Larry Bell and Jesús Rafael Soto. The Tampa Museum of Art, Tampa, Florida. Photo: Jean Marie Carey. 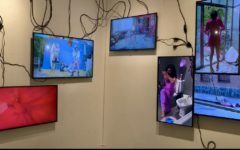 A dedicated museum exhibition showcasing the work of two artists from different global movements and periodicities but based rather upon visual associations alone is a rarity. 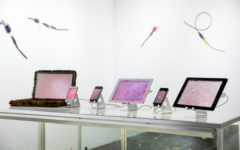 Indeed with the recent focus on collaborative practices and artist relationships in galleries and museums, the traffic on the formalist side of the road has not been particularly heavy. 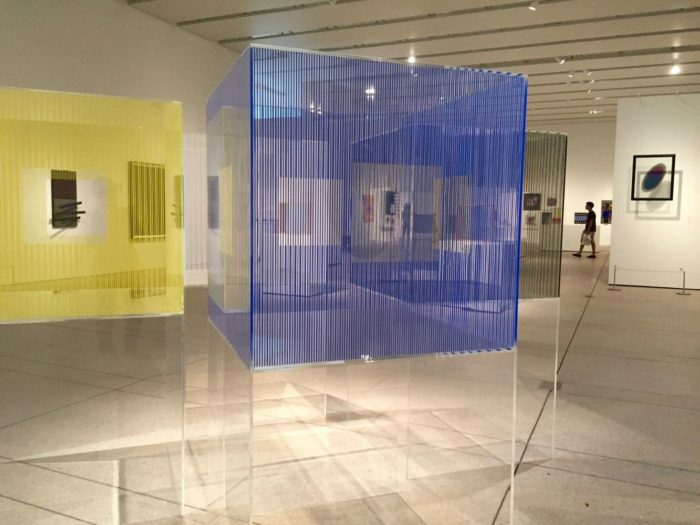 Characteristics of light and space were what prompted curator Joanna Robotham at the Tampa Museum of Art to make an excursion into symmetry with Vapor and Vibration: The Art of Larry Bell and Jesús Rafael Soto. In this show expanded field works of sculpture and print are organized thematically along three themes: Cubes and Structures, Vapor and Vibration, and Light and Transparency. 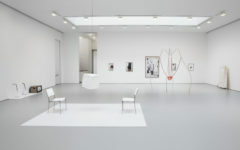 The 45 objects in the show from the 1960s to the present – despite bearing a strange sort of warning from the museum: “Please note the vibration effects of the artworks may cause disorientation or dizziness” – create a superficial and perhaps enduring impression of order and tranquility. Time, reflection, and learning something about the artists’ means of production produces a modified reception. Bell (1939- ), known originally as a sculptor, came from the Los Angeles minimalist scene in the 1960s. Relocating to Taos in the 1980s to a factory-style atelier producing multiples in tightly controlled conditions, Bell is represented in Vapor and Vibration by numbered prints and engravings on paper and glass. Coated on one side into partial one-way mirrors or tinted to 100 percent black, the surfaces of these works catch light but also swallow it, such as in Mirage Painting #256 (1991), a mixed-media work on white canvas that tricks the eye into seeing more depth than is actually there. Swatches and spots of black appear in many of Bell’s work in the TMA’s second level, and the effect taken together with the gallery’s mottled terrazzo floor – an artifact from the 1960s itself – is vaguely cosmic. 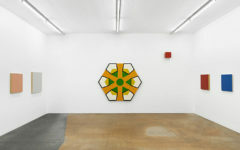 Jesús Rafael Soto, Ambivalencia en el espacio no. 23, 1981. Painted metal and wood. Courtesy of Gary Nader Art Centre, Miami. © Atelier Soto. Soto (1923-2005) left his hometown more forcefully and permanently, departing Ciudad Bolívar, Venezuela, in 1950 for Paris. As a faculty instructor at the conservative Maracaibo School of Fine Arts, Soto had found little enthusiasm for his interest in nonobjective work. Postwar France proved hospitable for Soto’s pursuit of the cube, and the artist was persistent in fashioning his émigré status as an artistic rather than a political one. 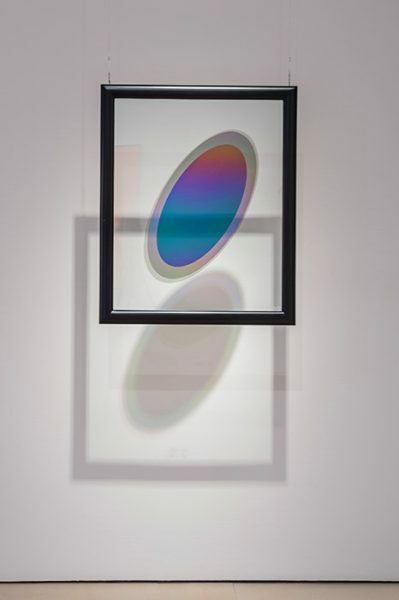 Larry Bell, Small Mirage Study #360BK, 1992. Mixed media on canvas. Tampa Museum of Art, Gift of the artist, 1993.002. Photographer: Philip LaDeau. © Larry Bell. Soto’s squares, the standout works of Vapor and Vibration, do crystallize a sparse, serene aesthetic. Severely reductive glass cubes and semaphore-patterned framed works are intentionally devoid of any craftiness which might indicate the human hand. Because of their rectilinear appearance, Soto’s glasswork in particular looks as if it might be factory produced. In fact, it was finished by hand, a tribute to Soto’s precision and resistance to over-designing. 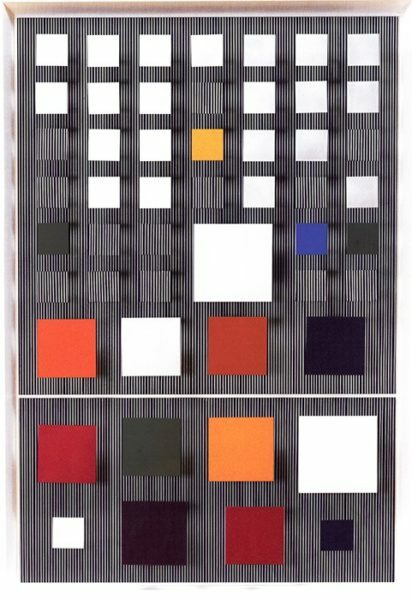 The renunciation of the maker’s mark invites looking at the wood, acrylic, and needles of Vibracion Pura para Sobrino (1987) as an exercise in pure form, but also evokes a sense of historical lineage to both the Parisian neo-avant-garde and the purism and probity of Venezuelan academic art. 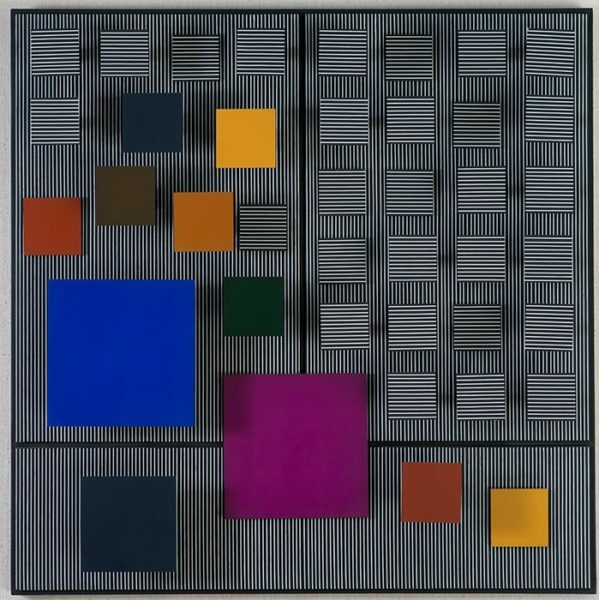 Jesús Rafael Soto (Venezuelan, 1923-2005), Color A La Izquierda, 1994. Mixed media. Collection of Maureen and Doug Cohn, Tampa. Photographer: Jeremy Scott. © Atelier Soto. Larry Bell, Untitled, 1985. Vaporized quartz on glass. Courtesy of McClain Gallery, Houston. Image courtesy of McClain Gallery, Houston. Photographer: Nash Baker. © Larry Bell. Interestingly both Bell and Soto experimented with and had plans for large-scale works. Bell’s studio in Taos is dominated by a jet-engine sized vacuum chamber capable of coating large sheets of Mylar and paper with metallic finishes. Soto made a series of sculptures in the mid-1960s named the Pre-Penetrables large enough to stand inside, and created an installation for the 1966 Venice Biennale made of rods hanging from the ceiling that enveloped spectators. 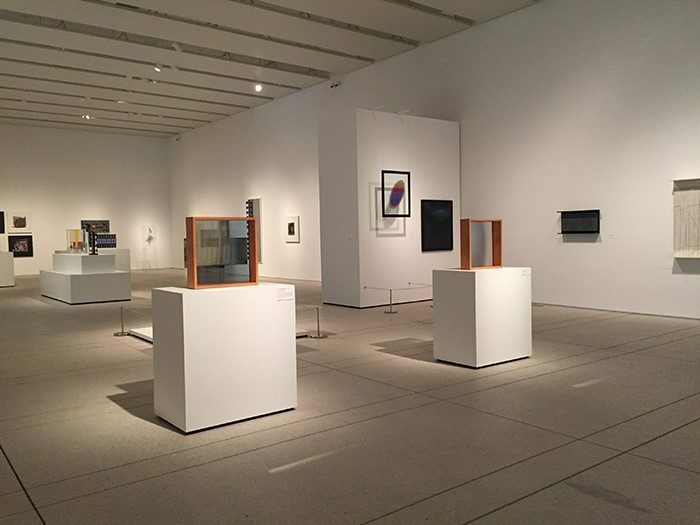 Installation view, Vapor and Vibration: Larry Bell and Jesús Rafael Soto. The Tampa Museum of Art, Tampa, Florida. Photo: Jean Marie Carey. Jesús Rafael Soto, Vibracion Pura para Sobrino, 1987. Wood, acrylic, and needles. Private Collection. © Courtesy of Soto Estate. Taking this into consideration gives a good phenomenological account of this dual-artist exhibition. 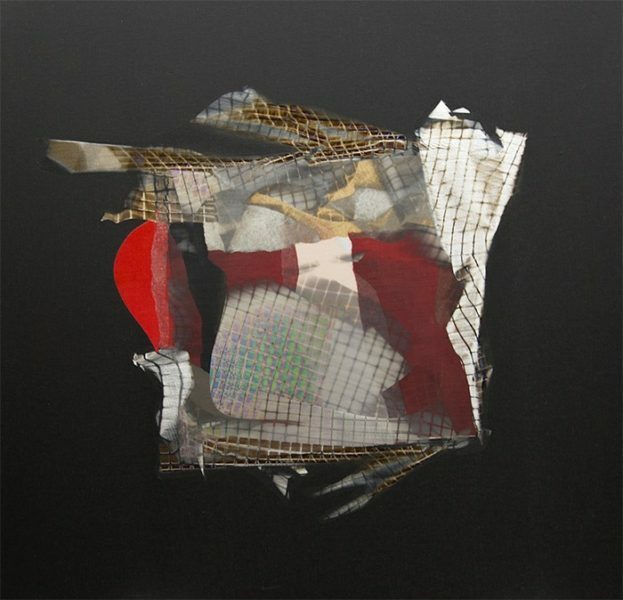 Despite the reliance of both Bell and Soto on anonymous elements of lines, squares, and hard-surfaced and shiny components, the small scale of most of the works in Vapor and Vibration is relatable to our own size and position in the world. Visitors to the gallery seemed to reflect a similar mental peacefulness, giving the work space while drawing as close as respectfully possible and spending more time than the average hurried museum visit with each work. Robotham’s achievement is teasing these aspects out through careful arrangement of the wall and floor displays, unifying the sculptures and prints with an attitude of simplicity, proportion. 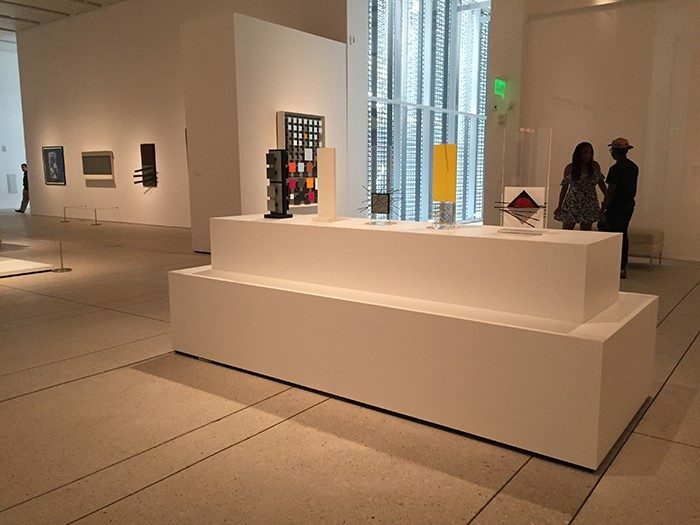 The sculptural elements, even the small towers of interlocking rectangular color blocks set beside one another on plinths, can be walked around and seen from three dimensions; aiding contemplation of the pieces and allowing a semi-transparent cube, for example, to declare itself in all its full objecthood. The result is a feeling of grace and spatial clarity. 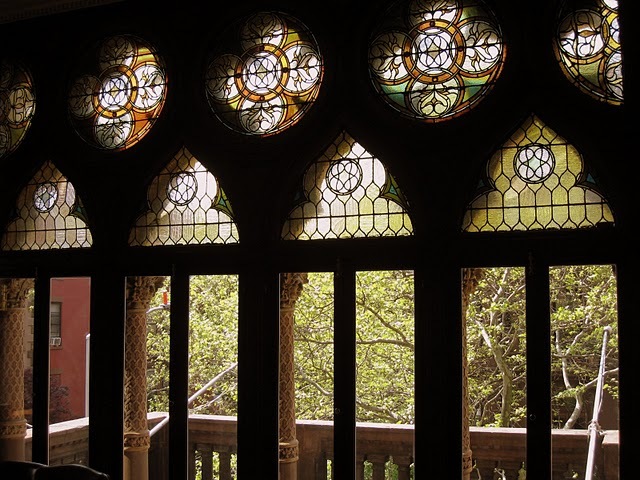 Writing and photos by Jean Marie Carey. Additional photos provided by the Tampa Museum of Art, provenance and rights as noted. IS AN ART HISTORIAN BASED IN MÜNSTER AND MIAMI. 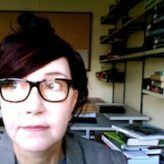 SHE WRITES ABOUT MODERN AND CONTEMPORARY ART FOR TEXTPRAXIS, THE EMPTY MIRROR, KAPSULA, AND THE ITALIAN ART SOCIETY. CAREY IS WORKING ON A 21ST CENTURY BIOGRAPHY OF FRANZ MARC, IS EMBARKING ON A PROJECT WITH THE ARKEOLOGISK MUSEUM STAVANGER TO CONNECT MARC’S WORK WITH AURIGNACIAN CAVE ART, AND TWEETS @POLLYLERITAE.